Annabelle is about to enter the world of le bon ton. But there is more to it than meets the eye. And not all of it is good. Fellsworth School is the only home that Annabelle Creswell has ever known. An artist at heart, she is curious about what adventure lies beyond Fellsworth's walls. When her long-lost aunt invites Annabelle and her younger half-sister to accompany her to Bellfield Crossing for the summer, Annabelle cannot resist a new adventure. Colin Ashton, on the other hand, has more adventure that he cares for. As a magistrate in Bellfield Crossing, he focuses on keeping illegal activity at bay. He has little time for frivolous activities, which he's certain are Annabelle's focus. Annabelle is enamored by the opulence that surrounds her at her aunt's home-more wealth than she has ever known-but it is the orphans at the local orphanage who really capture her heart. As she works among the community, Annabelle quickly finds herself the interest of several suitors. Colin warns her not everyone can be trusted, but she wonders if she can trust him. After all, she has been told stories about him. Colin's and Annabelle's paths continue to cross as Colin works to unearth the local smuggling ring and Annabelle takes her place in high society. Could Colin have been telling the truth? And will her aunt listen when Annabelle voices her concerns? Or will she send Annabelle back to Fellsworth and away from the life ... and man she has come to love? 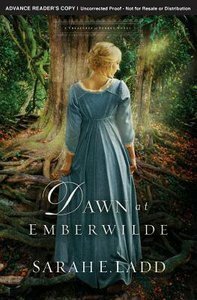 About "Dawn At Emberwilde (#02 in Treasures Of Surrey Novel Series)"